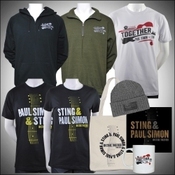 Sting & Paul Simon's On Stage Together tour may have finished last weekend, but Sting.com continues to bring you exclusive content from the road. In this clip, Sting says that working with Paul has been “wonderful” and calls his body of work “incredibly inspiring.” Check out this preview and then login as a member for the full video featuring exclusive performances from Sting and Paul Simon together onstage plus a revealing interview with Sting. To access the full video, you must be a paid member of Sting.com. Log in here. If you are not a member of Sting.com but would like to join for benefits such as exclusive behind-the-scenes content, early access to ticket sales and more, the details are here.